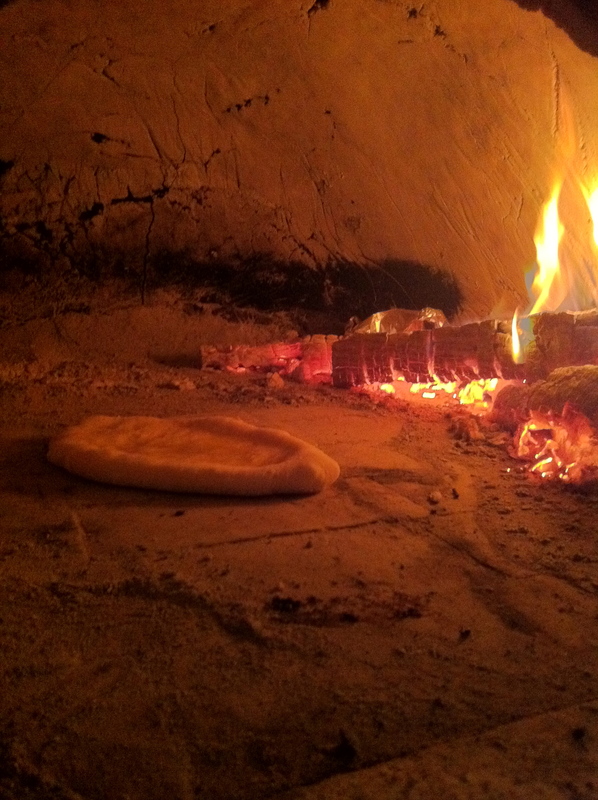 Flatbread baking in a wood fired oven. I was at an event the other night at the California Academy of Sciences. Cocktail party talk. In that context I was asked what I am so often asked, “What is your favorite bread.” It sounds flip, but it is true. My favorite bread is the most recent one I’ve made. In the case of the bread you see baking here it was, in fact, delicious, not just theoretically so because it was the most recent bread. It is a yeasted white dough on the salty side brushed with olive oil. My standard recipe for pizza and flat breads is 100% flour, 60% water, 1% to 1.5% salt, and if I am in a hurry, as I was the night I made this bread, 1.4% standard dried yeast. Always, when in a hurry, I use warm water so that the dough moves along. This doesn’t make the most complex dough, but it does make a dough that is light and sweet and lets the taste of something as simple as a brushing with olive oil rise to the top.